(TORONTO and BANFF, June 12, 2012) Increased private capital is the missing link for building up successful interactive digital media companies in Canada, according to a new report commissioned by the Canadian Interactive Alliance / l’Alliance Interactive Canadienne (CIAIC). 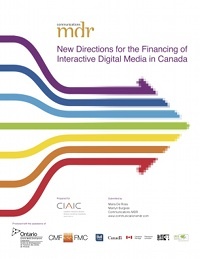 New Directions for the Financing of Interactive Digital Media in Canada is released by the CIAIC with research conducted by Communications MDR and authored by Maria De Rosa and Marilyn Burgess, in partnership with the Ontario Media Development Corporation (OMDC), Canada Media Fund (CMF) nand the assistance of the Bell Broadcast and New Media Fund, Department of Canadian Heritage, National Film Board and the Canadian Media Production Association. Starting today, the Canada Media Fund (CMF) will embark on a cross-country Outreach tour to answer questions regarding the changes to the CMF Guidelines for 2012-2013, the 2011-2012 funding results and the application process.